It’s a challenge to try and decrease your calories and portion sizes while preparing family meals and wanting to keep everyone happy at the same time. As you work on sharpening your healthier cooking skills, you may want to zero in on overcoming some common cooking challenges. 1. Save prep time. A couple of minutes saved here and a couple saved there can really add up. 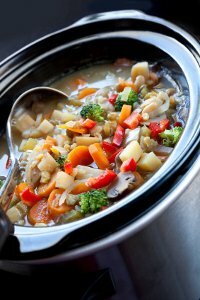 Some time saving tips I recommend are using minced garlic in a jar instead of fresh, buying cut up produce when available, using canned chicken broth instead of making your own, rinsing canned beans instead of using the dry varieties or using rotisserie chicken to make quick sandwiches, entrée salads, stir fry or pasta dishes. These short cuts may cost a bit more but they are great time savers when needed for those last minute meals. 2. Use healthy cooking tools. The quickest way to become a frustrated cook is to not have the right tools. You don’t have to do a complete kitchen makeover but you will want to make sure you have some key tools like nonstick pans, wooden spoons that won’t scratch nonstick surfaces, roasting pans for roasting vegetables or potatoes, microwave for reheating healthy leftover dishes, colander for rinsing canned beans or washing vegetables along with measuring cups, spoons and a kitchen scale to keep you on track. An indoor or outdoor grill offers a great way for you and your family to enjoy seafood, fish, chicken, lean meat or grilled vegetables. 3. “Doctor down” recipes. “Doctoring down” your recipes is a healthy cooking skill whereby you learn to lower the calorie and fat contents of your favorite recipes. For example, substitute reduced fat cheeses, light mayo and nonfat milk for the full fat varieties, remove skin from poultry and visible fat from meats before cooking, sauté your dishes in olive oil instead of butter, top vegetables with cooking spray instead of oil when roasting or use 2 egg whites or commercial egg substitutes for one whole egg. “Doctoring down” your recipes is a skill you can learn and refine and when done right, you shouldn’t notice any real change in flavors. 4. “Doctor up” dishes. “Doctoring up” your recipes is another healthy cooking skill where you learn tricks to enhance the flavors of your healthier meals. Examples include adding grilled onions, tomatoes and barbecue sauce to your veggie burgers, adding soy pepperoni and red pepper flakes to your vegetarian pizza, adding grated parmesan cheese to salads or canned soups or adding ground turkey to your homemade spaghetti sauce. Experiment using different fresh herbs or spices to awaken the flavors of your family’s meals. Engage the help of your children so they’ll feel more a part of the process. We hope these four tips will give you new ideas for sharpening your healthy cooking skills.